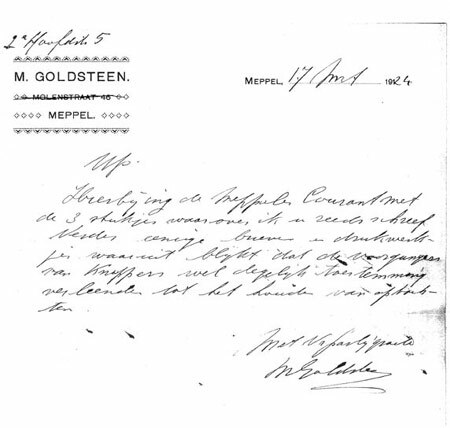 Moos Goldsteen was the son of Israël Goldsteen and Naatje Zeehandelaar. They had eight children: Mozes, Samuël, Abraham, Jacob, Eduard, Betsie and two stillborn children. During WWII only Moos and Sampie still lived in Meppel; they were both single. Moos was born on 13 January 1877, Sampie on 5 December 1877. Moos lived at 9 Noteboomstraat in a small house, with a flash of lightning painted on the wall. He rented the house from the Jewish Community. Sampie lived with his cousins Mozes, Saartje and Betje in the Hoofdstraat. 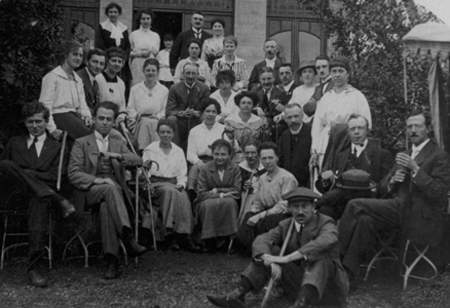 The Goldsteen family during a reunion in 1918. Moses sitting, smoking a pipe; his brother Eduard with a cap on his head in the foreground. Like nearly all the other Meppel Goldsteens Moos was a painter, a good professional. Not only did he paint your house, he also embellished it with decorations. On the mantel piece he painted for example farm houses or biblical scenes, whatever the client wanted. Once, a Staphorst farmer asked him to paint the Red Sea on his mantelpiece. This he did. When he had finished his pool of red water surrounded by sand, the farmer, who knew his bible texts well, asked him: ‘Where are the Egyptians?’ Goldsteen wittily answered: ‘They were all drowned’. 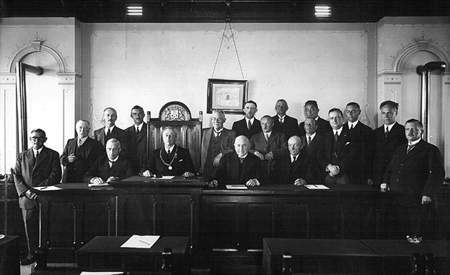 Moritz Lobstein (sitting, 2nd from right) and Mozes Goldsteen (standing, 2nd from left) were still members of Meppel town council in 1940. Besides painter Moos was politician and councilor for the SDAP (the Social Democrat Workers Party). On 7 May 1917 he had been appointed a councilor, when there was an interim vacancy. He was the only one on the list of candidates. As a councilor he was highly appreciated by the workers and the man in the street in Meppel. Moos was quite outspoken both during council meetings and in letters to the editor of the local Meppel newspaper. His epistles were not always grammatically correct so that someone said: ‘Goldsteen is better at wielding the brush than the pen’. In 1932 he was discharged as a member of the SDAP, because as a painter he had probably sold goods to the Meppel Housing Association. This did not keep him from being a councilor, though. In 1935 he was back with his own one man party. In 1939 his faction even consisted of two persons. At the end of 1940 came the end of his political career, although he was no longer a Jewish believer. He was dismissed from the council and the various committees. In one of his last meetings he declared he was against the appointment of eight extra policemen. Not only was Moos active politically but also as an administrator. He was among other things chairman of the Burgersociëteit, which always had its meetings in Hotel Westerbeek. Die Äußerungen des Juden Moses Goldsteen, wohnhaft Meppel, Nooteboomstraat 1, richteten sich nicht gegen Deutsche, sondern gegen Angehörigen des NSB. Wenn wegen derartigen Äußerungen seitens der Sicherheitspolizei eingeschritten wird, werden in Kürze alle Beleidigungen der Mussert-Leute an uns herangetragen werden. Erbärmlich ist es auf jeden Fall, daß sich NSB-Angehörigen derartige Äußerungen von einem Juden gefallen lassen. Der Jude Goldsteen ist vorläufig nur karteimäßig zu erfassen, um bei erneutem Inerscheinungtreten auf das vorhandene Material zurückgreifen zu können. After Goldsteen’s departure from Meppel things went wrong. 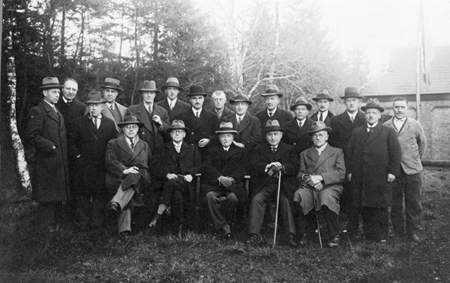 Mozes Goldsteen, standing left with pipe, during a gathering on the occasion of the official opening of the petrol station on Havelterberg. Moos was sitting in the August sun in front of his house on Noteboomstraat, smoking a pipe. The flashes of lightning that he had painted on the façade in an exuberant mood, made this 31 August an extra frightening day. Klaas van Dorsten, on his way to the attic where he stored his potatoes, opposite Goldsteen’s house, saw him sitting there and remarked: ‘You are smoking a nice pipe, I can smell that’. ‘Yes’ Moos said, ‘it’s a good one and also my last one’. When he had finished smoking he went inside, put his pipe on the table, took his small suitcase and walked off. Klaas said to him: ‘Moos, don’t do it, please hide in our potato attic. We’ve already prepared a place for you’. Moos reacted: ‘Why should I hide; the war is nearly over and then I’ll come back’. Then he closed the door and shuffled through Woldstraat towards the Wheem. There, in front of Hotel Westerbeek, his old local, was the DABO bus that would take him to the work camp at Orvelte. He has never been back in Meppel. At the beginning of October he was conveyed from Orvelte to Westerbork and from there to Auschwitz on 5 October, where he died on 8 October.